We met our tour group at Charles De Gaulle Airport outside of Paris. We were touring with the Missouri Botanical Garden, so we easily spotted the director, Peter Wyse Jackson and his wife Diane who were our hosts for the trip to Ireland last year. We knew a few of our fellow travelers from the Ireland trip and other Garden activities and enjoyed getting to meet new people. 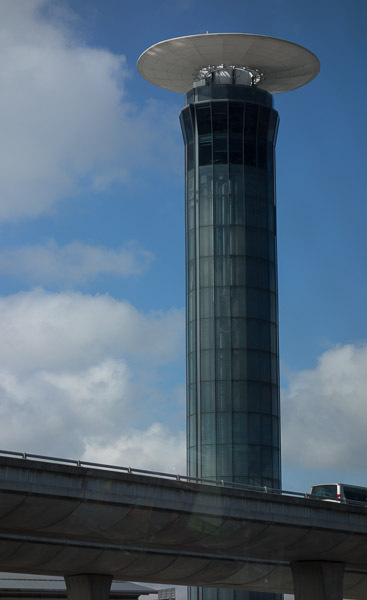 Rick was fascinated by the cool-looking airport control towers at De Gaulle airport and took a photo of one out the window of our bus. Our first stop on the tour was Royaumont Abbey. This medieval Cistercian abbey was a wonderfully calm and peaceful place after our already long day of travel. The site hasn’t been an abbey since the French Revolution. Some of the buildings, particularly the church, were demolished to reclaim the stones. 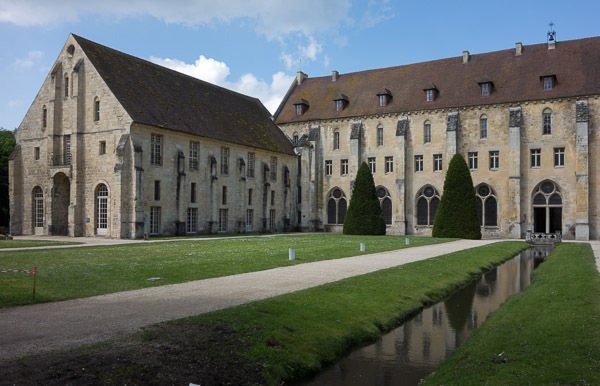 Today, Royaumont Abbey is a cultural center used for concerts and weddings. Here’s the official website in English: Fondation Royaumont. The remaining buildings of Abbaye du Royaumont. The chattering room where the monks were allowed to speak and held meetings. It’s now a library and archive for research. 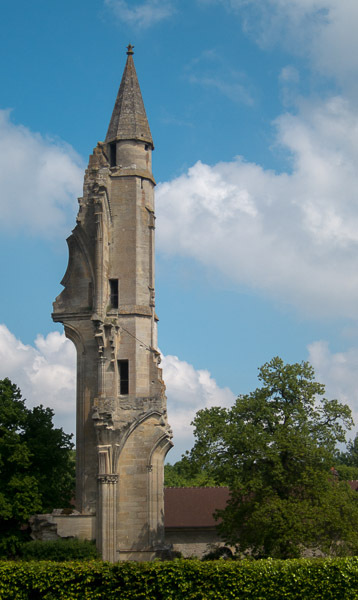 This tower is a remaining structure from the church which is now in ruins, most of the stones were reclaimed for new buildings after the French Revolution. 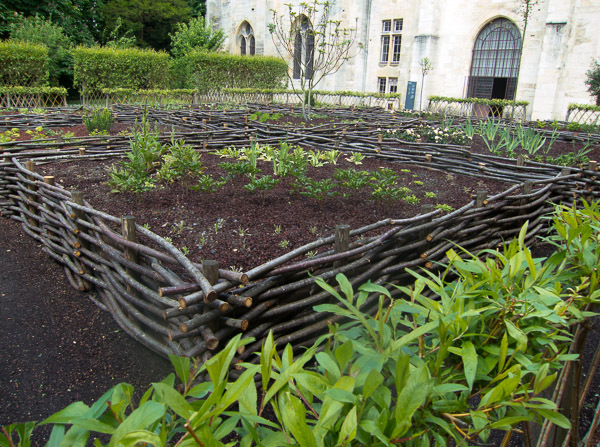 The medieval garden at Royaumont Abbey is planted in square raised beds. A new theme is chosen every three years. We saw the new installation of plants believed to have magical or symbolic properties. I put many more photos from our visit to Royaumant Abbey on Flickr: Joy’s Photostream. While I wasn’t blogging much in the last month, Saturday Snapshot moved from At Home With Books to West Metro Mommy Reads. Check out Melinda’s interest in a fun community college class and other photos around the web at her Saturday Snapshot post today: Saturday Snapshot – June 8. I intend to post my France photos on Mondays (for Dreaming of France), Wednesdays (for Wordless Wednesday), and on Saturdays (for Saturday Snapshot) for the next several weeks. Beautiful! I would love to visit that abbey. Sigh 🙂 I think it would be wonderful to see things that are older than our country! How fun to travel with a group you know! I’ve never been to Charles De Gaulle – when we lived in France, international flights flew in and out of Orly. So impressive! I’m glad you had a good time…and thanks for sharing. Also…thanks for visiting my blog. Oh, I love the chattering room. I could spend hours in there browsing and reading. Lovely photos! I find CDG particularly ugly, all those 70s concrete spirals, but I am always so excited to be there. Arriving there at least. Not so much with the leaving. I’ve never heard of Royaumont Abbey, although of course it looks fantastic. There are so many amazing places to visit in France. I’m just about to return for my third visit and have barely scratched the surface of my wishlist, and so many are wonderful for return visits too. What a beautiful abbey! 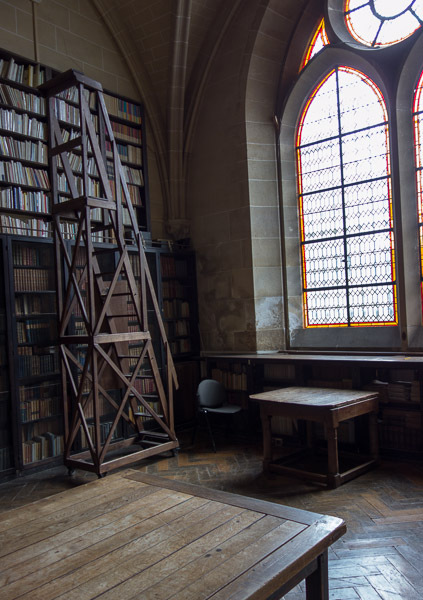 I love that reflecting pool–and those enormous bookcases! Your tours sounds like it was a lot of fun. I like the way they made those raised beds in the garden. I’m always looking for new gardening ideas but that looks like a lot of work! Sounds like you’re having a great time! It must have been great seeing people from your trip to Ireland! Love the photos! So beautiful! I’ve never been (and probably never will get to go) to any of these places so it’s fascinating to see your photos. It must have been a wonderful trip! So much history!